I’ve mentioned before that I’m a big fan of The Flight Deal. I check their website several times a day, subscribe to their Daily Deals Newsletter and follow them on Twitter. If you consider a crazy cheap fare as reason enough to travel, then you should be following The Flight Deal too. This year they’ve found some great deals like $397 fares to Hawaii, sub-$800 fares to places like Istanbul, Hong Kong, Tokyo, and some sub-$200 fares to LA, San Francisco, New York, and lots of other cities. What makes them different than all the other fare tracking sites is that they look for value and not just a low price. They only publish deals that are priced at 6 cents per mile or better. Now that we’re coming up on the end of the year, many of you may be looking for some mileage run opportunities in order to maintain your AAdvantage elite status or to bump you up to the next level. Miami, Los Angeles, New York are highly competitive markets, so finding a good AA mileage run is pretty easy. It’s a lot tougher though if you’re in Dallas or Chicago. Are good deals on American possible from Dallas and Chicago? Dallas and Chicago are two of the top ten most expensive United States airports to fly out of according to the Bureau of Transportation Statistics. It is even more so for American Airlines’ flyers. Since August 2011, only 20% or 28 out of 135 of our published deals from Chicago are on American Airlines. We only recently started coverage for Dallas, but based on our limited data set, the number of American Airlines deals is even worse. Faced with lack of deal selection in general, how should you go about finding good deals? Use scheduled fare updates to your advantage. Airline fares are not updated in real time . Legacy carriers like American Airlines rely on global distribution systems (GDS) like Amadeus, WorldSpan and Sabre to distribute their fares to travel agencies and websites. Due to the legacy platforms that both the suppliers and distributors exist on, fare data is sent in batches at predefined times. They are sent at 10AM, 1PM, 4PM and 8PM Eastern on weekdays and only once at 5PM Eastern on weekends. While fare updates can theoretically happen every day, airlines still have most updates on Tuesdays and Wednesdays at 10AM and 4PM. We search 15 minutes after the update times to let the fares propagate throughout the distribution platforms and that’s when we find all the best fares! For example, if United attacks American fares at 10AM, and if American responds, it will likely happen in the next batch update. This happened in Dallas with the recent $397 fare to Honolulu that United put out and to which American subsequently responded. Warm weather and Chinese destinations are the cheapest. If you need a starting point, focus your search on warm weather or Chinese destinations. Based on our experience, for domestic mileage runs, San Juan in Puerto Rico, Hawaii and St. Thomas are the cheapest destinations. For international travel, we found that Beijing and Shanghai are the cheapest destinations. If last year is any indication, in the next few weeks, prices on American Airlines from Chicago to Beijing or Shanghai will be around $800. We started coverage for Dallas only this August so we don’t have enough data points for international runs from Dallas just yet. When JetBlue and Virgin America enters a particular route, prices go down. Prices for business heavy routes like San Francisco/Los Angeles to Chicago have dropped since Virgin’s entrance while the same is true for Dallas to Boston due to JetBlue’s entrance. 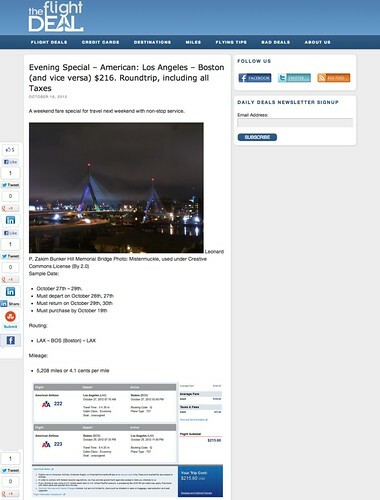 Sub $200 fares for San Francisco/Los Angeles–Chicago and Dallas–Boston can happen. All these fares are possible because JetBlue and Virgin America are now competing with American on those routes. When these low fares come up, use the AA.com 24 hour risk-free hold function because the fares won’t last. In August, AA had a $121 DFW-BOS fare that lasted 3 hours. There’s always a ‘but’. Without Double Elite Qualifying Mile (DEQM) promotions, sub-4 Cent Per Mile (CPM) fares are really rare from Dallas and Chicago. If you have BA Avios points, use them to start your mileage runs from either New York, Los Angeles or Boston where AA deals are much more abundant. Otherwise, be realistic with your CPM expectations. You pay more, but you have a lot more nonstop flight options than other cities. Good deals on AA out of Dallas and Chicago are possible. When they appear, use the AA 24 hour risk-free HOLD to firm up your travel plans. Don’t over-think it. A big thanks to Matt and the Flight Deal team! I’m a fan as well. Thanks for the post. Thanks for posting I love The Flight Deal too. Being based out of DFW this really explains a lot about the difficulty in finding a good MR out of the AA hub. @ Jamison, Rick and perryplatypus – I’m one of the The Flight Deal’s biggest fans and was excited to have them share some of their knowledge. Great site and insight. I’m a novice after 3 years as EP with AA need 20,000 to retain. Could get 10,000 and pay $1800 to retain. Your counsel has been priceless. I’ll keep looking with the new knowledge you have provided.